In the early 1920s it became clear that Yosemite National Park was in dire need of accommodations that would suit the affluent and influential park visitor. 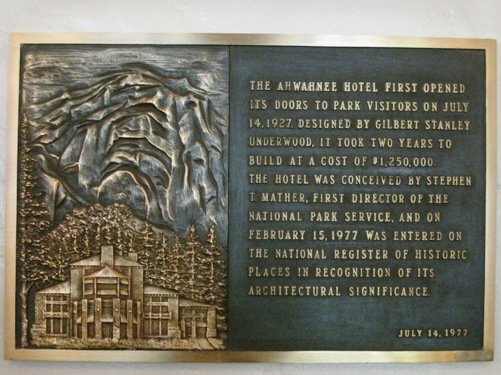 Once a village area for the native Miwok Indians, the location of The Ahwahnee Hotel was chosen because of its ample sun exposure and breathtaking views of the Park’s most notable icons; Glacier Point, Half Dome, and Yosemite Falls. 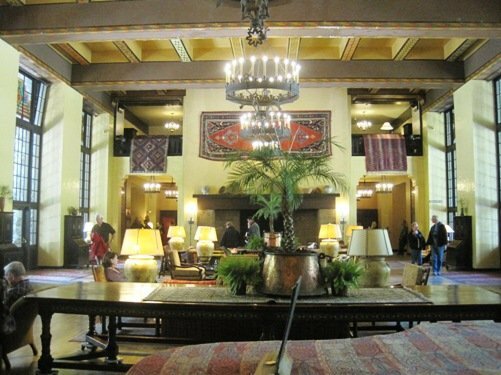 Because of the remote location of the build site, the construction of The Ahwahnee was considered the most complex trucking mission of its day. Over 1,000 tons of steel, 5,000 tons of stone, and 30,000 feet of timber were lugged over the mountain roads. 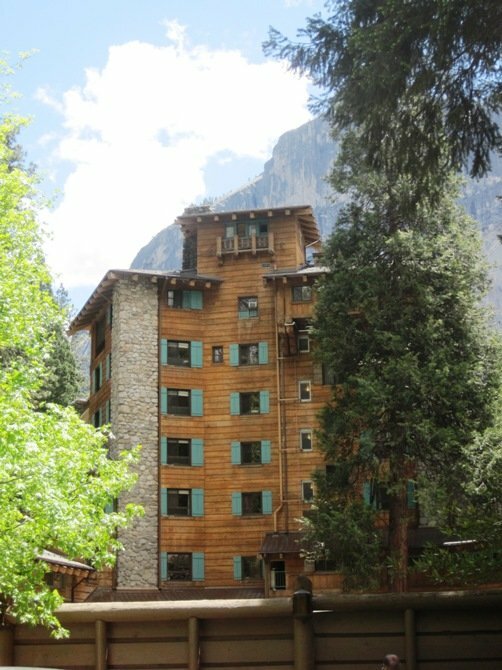 You definitely can’t tell by looking at it, but the exterior of The Ahwahnee Hotel is actually a wood-like façade composed of concrete that was poured into rough-hewn wooden forms then stained to look like redwood. This was done in order to protect the hotel from fire – a fate met by many of the Park’s earlier hotels. 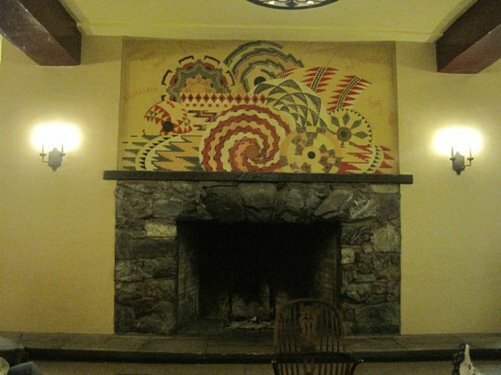 The Ahwahnee Hotel’s interior is also a style all its own – a unique blend of influences including Art Deco, Native American, Middle Eastern and Arts & Crafts Movement. Some of the most beloved parts of the hotel are its impressive public spaces that include elegant stained glass, giant stone fireplaces, massive hand-stenciled beams, and rich tapestries. 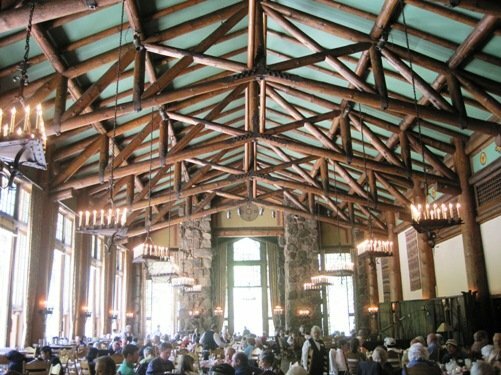 The Ahwahnee Hotel Dining Room is an incredible sight to behold. It features a 34-foot high ceiling with huge sugar pine trestles, and windows framed with stained glass that go from the floor to the ceiling. The dining room is also home to some of the most noteworthy culinary events in the country, including The Bracebridge Dinner, Vintner’s and Chef’s Holidays. Another magnificent common area of the hotel is the Great Lounge. With ten 24-foot-high floor-to-ceiling windows with original hand-stained glass panels that beautifully light the room during the day, the Great Lounge is 77 feet long and 51 feet wide. Hand woven Native American baskets add an authentic feel to the room, while the large stone fireplace and wrought-iron chandeliers bring a warm glow to the room in the evenings. 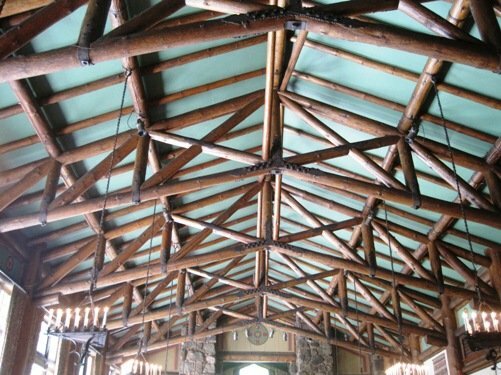 If you’re looking for an elegant way to enjoy Yosemite National Park, The Ahwahnee Hotel is the place to be! – Conceived by Stephen T. Mather, the first director of the National Park Service. – Designed by Gilbert Stanley Underwood. – Took two years to build, at a cost of $1,250,000. – First opened its doors to visitors of Yosemite Park on July 14, 1927. – Became part of the National Register of Historic Places on February 15, 1977. This entry was posted on Monday, June 6th, 2011 at 2:53 PM	and is filed under Nearby Attractions. Both comments and pings are currently closed.